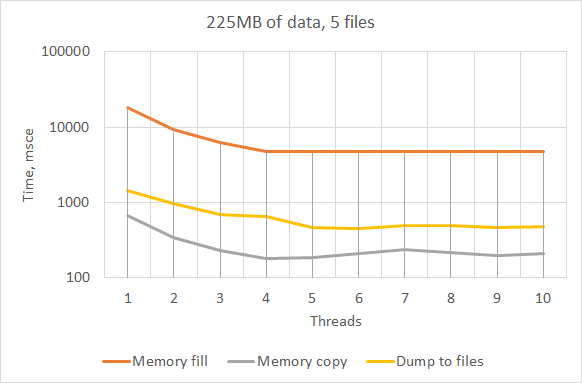 The small test program shows how memory and file I/O operations can be accelerated using multiple threads. The program doesn't use any concurrency control synchronizations because the processed memory chunks aren't intersected so there is no data race conditions. The test program is compiled with Microsoft (R) C/C++ Optimizing Compiler Version 19.13.26132 for x86 (Visual Studio 2017 Community Edition). It can be seen that a program manipulating multiple threads can accelerate not only CPU-used code execution (like random values generating) but simple I/O operation like memory copy or writing to multiple files. As expected, using the number of threads exceeding the CPU core count doesn't have any effect. Try to test it in hyperthreading mode.